UPS has secured a multi-year sponsorship with live events company, Live Nation, which is aimed at promoting UPS’s environmentally responsible logistics solutions to music fans across North America. As part of the multi-year deal, UPS will be the exclusive global package, shipping and logistics sponsor and the Official Sustainability partner of of Live Nation Entertainment. Both parties will work together to reduce waste and use more efficient products across Live Nation music tours and venues. A first step in this sustainability effort is to provide carbon neutral UPS shipping for music fans across the United States. Through UPS, Live Nation Entertainment will purchase certified carbon CO2 offsets to mitigate the emissions produced by the transportation of ticket orders for events at Live Nation owned and operated venues and merchandise purchased from the Live Nation Entertainment store. As part of the alliance, UPS will also help eco-conscious musical artists reduce the CO2 output of their concert tours. 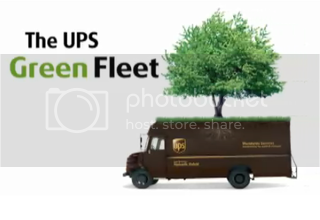 UPS will provide participating artists with an accurate, verified measurement of their existing transportation carbon footprint; develop customized plans that leverage UPS’s integrated, multi-modal network to reduce emissions, then mitigate any remaining CO2 output by purchasing and retiring certified carbon offsets. Beyond the sponsorship’s sustainability initiatives, UPS will promote its brand across Live Nation Entertainment’s entertainment platforms, which serve over 30 million fans annually in North America, including in-venue signage, hospitality events, VIP ticketing and backstage experiences. UPS also will advertise across Live Nation Entertainment’s online platform.